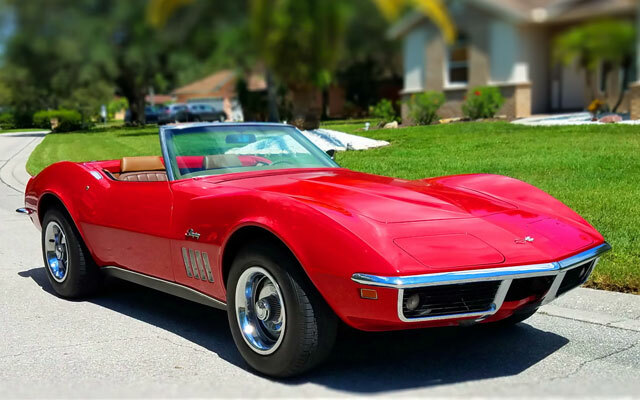 The Deal of the Day on the internet this week is a 1969 Corvette Stingray Convertible from The Vette Net, a Florida classic car broker. Red and ready, this beautiful roadster really takes a great photo. The Vette Net has listed a very interesting 1969 Corvette Convertible at a very good price point. (Follow this link to find more photos and a short history.) They say the 20-year-old laquer paint is showing some patina (they consider it a seven out of ten.) All instruments function, and the body shows well with good alignment. The air conditioning system was gone through and blows cold. Although the engine is NOM, it runs well, they say. The rear end and springs were rebuilt, as were all brakes, lines, master cyinder. It has new power steering, new shocks front and rear, new fuel tank, new fuel lines, pump and sending unit. I think you will agree this is a lotta’ car for the price. Click here to view a walk-around video. So it will be our featured DEAL of the DAY on Saturday. The asking price is $26,990. The DEAL of the DAY preview gives you first shot at all the cars that will be featured in the DEAL of the DAY section on the Cars On Line home page. Often these cars sell in the newsletter before they even make it to the home page! You’ll always see them here first though. 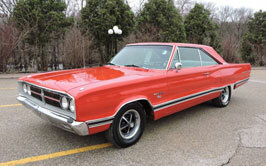 Tap this link to preview all of this week’s DEALs of the DAY on the Cars-On-Line.com home page.